Maternity Breastfeeding Pillow Cover by Danha-Newborn Baby Feeding Cushion Case-Cute Donut Shape Wedge Pillow-Best Infant Support-for New Moms-White Arrow Prints Slipcover by Danha at My Pregnancy Place. MPN: NURSING. Hurry! Limited time offer. Offer valid only while supplies last. Keep Your Nursing Pillow Fresh and Clean Every TimeAre you worried about keeping your maternity pillow clean and neat for each breastfeeding session? Are you worried about keeping your maternity pillow clean and neat for each breastfeeding session? Don't be. With this wonderful, premium quality nursing pillow case, you can now have peace of mind. Beautiful and practical, this cute, white arrow slipcover will protect your nursing pillow and keep your precious baby happy and dry at all times. This gorgeous cushion case has quickly become new moms' favorite, due to its exceptional quality, breathable fabric, practical design and lovely pattern. Being highly absorbent, silky soft and hypoallergenic, this newborn baby feeding cushion case is an excellent choice for moms, who are looking for a stylish, yet practical and safe solution to keep their maternity pillows clean. With its fashionable, lovely pattern, this unique baby feeding wedge pillow cover is great for new moms with baby girls or baby boys. When breastfeeding, there can always be messy moments. Don't fret. Simply, unzip and take off the slipcover in one breezy motion and place it in the washing machine along with your other bedding items. The fabulous fabric of this maternity pillow case is extra durable and will get softer after each wash, so you don't have to worry about a thing. If you're searching for a beautiful, yet very practical gift for your friends' baby shower party, this is the perfect choice. Every new or expecting mom is sure to love such a thoughtful and convenient gift for her newborn infant. 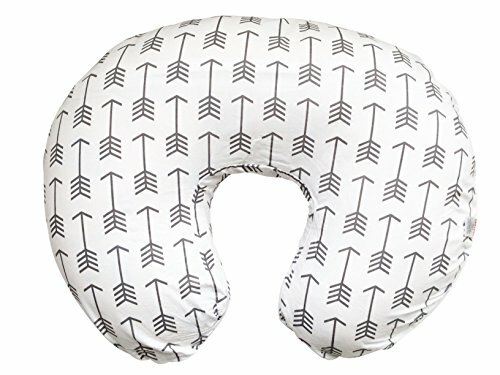 ADORABLE MODERN ARROW PATTERN: Beautiful and exclusively designed to keep your maternity pillow fresh and clean everytime, this adorable white arrow pattern slipcover is the perfect way to enjoy mess free, cozy breastfeeding moments with your precious baby. SOFT AND SUPER COMFY: Your baby will love how luscious and soft the fabric of this pillow case feels to the skin. Hypoallergenic and completely safe, this beautiful donut-shape baby feeding cushion cover is made of high quality, breathable and extra absorbent fabric that will fit snuggly in all standard baby pillow brands and allow you to keep your baby supported at all times. SAFELY LOCATED ZIPPER FOR MAXIMUM COMFORT: Thoughtfully designed, the zipper on this nursing pillow cover is safely placed on the back side, so as to keep your baby secure during breastfeeding time and allow you to easily put it on and take it off when needed. PERFECT BABY SHOWER GIFT: Make an unforgettable gift to your expecting friends. With its lovely, fashionable, pink floral pattern, this maternity pillow slipcover is the right gift for a baby girl or baby boy shower party. If you have any questions about this product by Danha, contact us by completing and submitting the form below. If you are looking for a specif part number, please include it with your message.